An understandable, comprehensive manual that outlines employers’ legal rights and responsibilities when hiring and managing foreign employees. 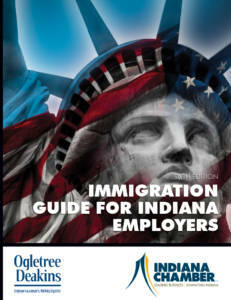 This guide includes detailed discussion of the different visa options available to foreign employees and the qualifications and procedures for obtaining each type of visa. Employers are facing unprecedented levels of scrutiny in all aspects of immigration law under the Trump administration. President Trump has issued many executive orders that have significant impact on immigration law, including travel bans, extreme vetting at U.S. consulates, proposed changes to the H-1B visa requirements, and “Buy American, Hire American” policies. All of these topics and more are addressed in this new edition of the guide! The law firm of Ogletree Deakins. Who should order this product? Anyone interested in being in compliance! What are some of the topics covered? To order, add this guide to your shopping cart or call customer service at (800) 824-6885. IF YOUR COMPANY IS TAX EXEMPT, PLEASE CALL CUSTOMER SERVICE TO PLACE YOUR ORDER.